The awards began in 1994 and are still going strong. The structure hasn’t changed much, however we have fiddled with the categories to reflect the changes made in the last two decades in how our institutions are communicating with the public. 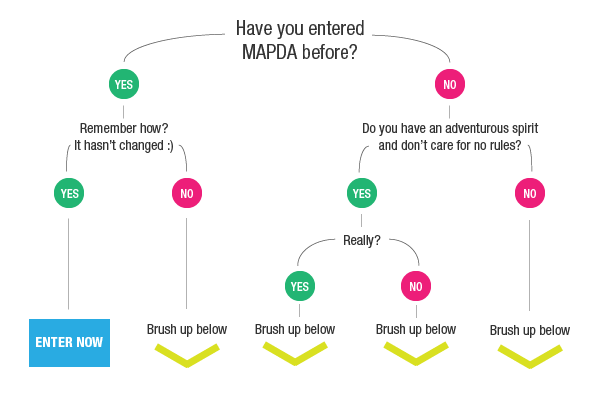 MAPDA Entry Levels are based on your organisations operating budget. The corresponding MGA membership categories are reflected below. Note: MAPDA charges a fee for entry. The fee applies for each entry submitted. Members of Australian Museums and Galleries Association or Museums Aotearoa receive a discount. The MAPDAs are open to all non-commercial museums, galleries, zoos, botanical gardens, historical societies, libraries, keeping places, science centres and other cultural organisations. Commercial galleries, auction houses and publishing interests are not eligible. Members and non-members of Australian Museums and Galleries Association are eligible (note the differentiation in entry fee). Entries must come from organisations, associations and non-profit companies, not individuals or designers. An entry is defined as printed or electronically designed graphic material intended for public distribution. Entries must have been produced between 1 January and 31 December the year prior to the awards. Entries should be posted with the registration form, payment and entry form attached to each entry to arrive at MA before the closing date. All publications will be credited as indicated on the registration and entry forms. Please ensure names are listed correctly and legibly. Entries will not be processed until payment is received. Museums may submit multiple entries in any category, but these can only be entered in one category. A series of publications may be submitted as one entry (e.g. newsletters, magazines, posters, online). One copy only of any publication must be supplied in its intended form – printed materials as hard copy. Multimedia and website entries to note the URL address for viewing or upload a file. An impartial judging panel drawn from the museum and graphic design sectors will judge entries. The judging panel reserves the right not to make an award in a category if it considers no award is merited; or to make a joint award. Decisions are final and no correspondence will be entered into. Ensuring an entry’s timely arrival, good condition and correct information is the responsibility of each entrant. Publications will not be returned. Entries become the property of AMaGA. Entries may be used for exhibition purposes. Publications may be sold to raise funds for Museums Australia Fund – AMaGA’s charity. By submitting an entry, the entrant grants permission to AMaGA for the reproduction of winning entries for the purposes of publicity and promotion at no charge; entrants must warrant they have the right to allow such use by AMaGA. Please print your invoice and attach it to your physical entries and post to MAPDA as soon as possible. You do not need to post anything for electronic entries. For a physical address for courier deliveries or drop-offs, please give us a call on 02 6230 0346. The publication’s ability to communicate effectively and meaningfully – is it fit for purpose? What constitutes a series of publications? How should we attach the entry form to the entry? I’m an individual with a self-published book. Can I enter? A series of publications is considered ‘as having the same design element ’ – a series of materials (e.g., a multi-volume set of books), where each individual component has clear and recognisable graphic similarities to the others and cannot be accurately judged alone. Otherwise, you must either enter just one component of the series or enter multiple components as separate entries. For example, you cannot enter a book, poster and invitation for the same exhibition as a series, or catalogues that have been produced by one institution that have no design connection. However, you can enter three brochures with the same design but different information as a series. To put it simply, same design, different exhibitions, OK. Different design, different exhibitions, not OK. The entry should be attached using removable tape or removable sticky dots. Please do not use ordinary sticky tape, paper clips, masking tape or staples(!!) as the judges may need to remove the entry form to accurately judge the entry. The MAPDA awards are open to all non-commercial museums, galleries, zoos, botanical gardens, historical societies, libraries, keeping places, science centres and other cultural organisations. Individual entrants are taken on a case-by-case basis. Please call or email us and we can give you an answer based on your circumstances. Remember that you will be up against institutional entrants, some with very large budgets.